The ownership of exotic pets is becoming more and more popular. These pets can be fun to own but there are also other important considerations to take into consideration such as how to look after them and give them proper care. Here are a few popular weird and wonderful pets and a few tips on the right care. Move aside cats and dogs! About: Bearded dragons make great family pets as they are docile creatures that can be easily tamed with frequent, delicate handling. While they are relatively small pets (usually growing to around 16 - 24 inches) they still require lots of love and care. Environment: Bearded dragons love to socialise, so if you want to, you can keep more than one in a cage together. However it is not advisable to put two males together as they may get competitive and injure one another. Two females are fine together. If you want a group of bearded dragons, make sure there is only one male and that the females are of a similar size. You'll need to house your bearded dragon in a vivarium – which is an enclosed cage with glass doors - this allows them plenty of room, bearing in mind that a bearded dragon can grow to up to 24 inches. If you are keeping one bearded dragon, the cage should be at least 90cm long, and two will need a cage that's at least 150cm long x 50cm wide x 50cm high. The vivarium will need to be kept well ventilated at all times, with no humidity. This is because bearded dragons are desert reptiles so need to be kept in conditions as similar to this warm, dry environment as possible. You will also need to monitor and control the temperatures in the cage regularly. Lifespan: When they are properly cared for, bearded dragons can live for around ten years. Feeding: Bearded dragons are omnivores, meaning they eat both insects and plants. 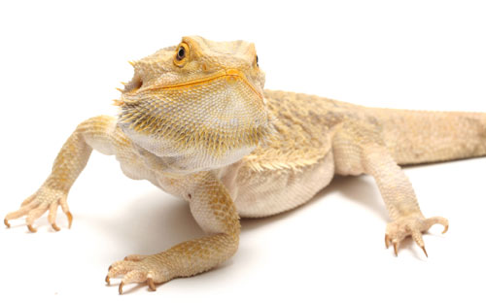 As a guide, live insects such as locusts, mealworms, earthworms and crickets should make up about 50 per cent of an adult bearded dragon’s diet. The other 50 per cent of your pet's diet should be made up of either fresh or dried food. Fresh food should be mostly greens such as dandelions, watercress, spring greens and rocket, with some vegetables such as grated carrot or pepper. Any food that is not eaten must be removed from the vivarium each day. Health: Bearded dragons do not need annual vaccinations like cats and dogs do, however they will need to be treated for fleas and worms. You should have regular check ups with your dragon at an exotic vet specialist who will be able to give you more information treating them for parasites. About: Hedgehog’s are fun to watch, quiet, not aggressive, and are fairly easy to care for. They can be a wonderful addition for someone who wants a unique and entertaining pet. The African pygmy hedgehog is the most common type sold as pets and can grow to be around six to nine inches long. The hedgehog is a solitary animal and should live alone however do enjoy human contact and your hedgehog will learn get to know you over time. Environment: Hedgehogs are small, but are very active and need quite a bit of space. The cage should be at least 4 feet long and 2 feet wide, but go with the biggest cage possible. Bigger is always better when it comes to your pet’s home. The bottom of the cage will need a bedding or substrate. There are a variety of different types of bedding that work well; the fluffy bedding made from recycled paper or pulp is an excellent choice. Try to avoid wood shavings since some can be harmful to your companion. A place where your hedgehog can hide, feel safe, and relax will be needed in the cage. A wood box, pet igloo, tubing, half log, or tunnel can all be used as a hiding area. 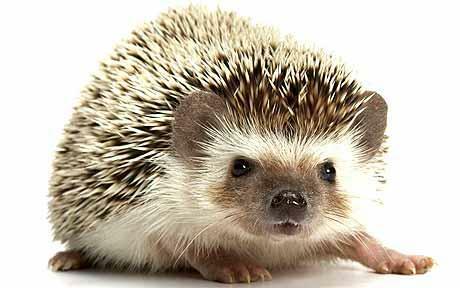 Lifespan: A pet hedgehog can live up to ten years if cared for properly. Feeding: In order to keep your hedgehog healthy it is important to provide a high protein diet. Commercial dry or wet hedgehog food is available or cat and dog food can also be used. This should be the majority of the diet along with a small amount of fruits and vegetables such as green beans, peas apples and carrots. Health: Hedgehogs do not need annual vaccinations but again they do need to be treated for fleas and worms and also mites. You should also have regular check ups with your hedgehog at an exotic vet specialist. About: Tortoises can make a fun and interesting pet but are not as easy to maintain as some other pets. They require lots of space and a natural habitat along with a healthy diet. The Hermann’s tortoise is one of the most popular breeds to keep as a pet. This breed develops a bond of companionship with their owner, and you will get to know their individual quirks, likes and dislikes. They live about 75 years, which gives us something in common! Environment: We advise using a wooden vivarium rather than glass as they retain heat more efficiently keeping your pet nice and warm. As Hermann’s Tortoises are quite slow growers we advise a vivarium of 36" x18" x18" as a youngster and a 48" x24" x24" for adults. This will ensure your tortoise has enough room to explore and move around. Beach woodchip is a good substrate to put in your tortoises environment. Sands, such as calci sands can be ingested easily, building up inside the animal potentially causing health problems and distress to your pet. Hermann’s Tortoises are very active and require decor to climb around on, however you should make sure it's not too steep as the tortoise may fall. You can use artificial plants to brighten up the vivarium and make it more natural. Being from the Mediterranean, they do not cope well with temperatures lower than 70oF (21oC). Unless you’re living in a very hot climate, you will need to make arrangements to house them indoors. Many Hermann tortoise owners keep them indoors most of the time, and have an outdoor pen for them for when the weather is fine. This gives them the best of both worlds; the warmth of the indoors and the space and freedom of the garden. This is the best solution if you have the space. During the day a spot bulb is used to raise the temperature to about 80 - 90oF. This should be at the one end of the vivarium to create a hot end and a cooler end. The spot bulb will also provide a day and night cycle and should be emit a UV light as tortoises need this to synthesise vitamin D. Temperatures should always be checked by a reliable thermometer. Lifespan: This particular breed has a lifespan of around 75 years. 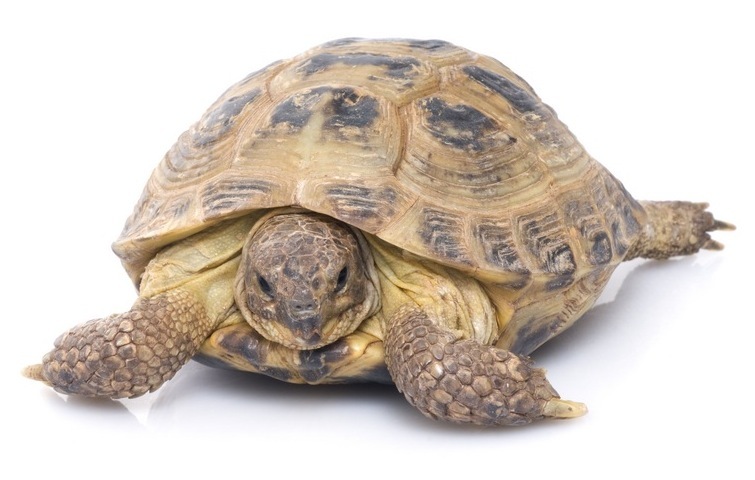 Other breeds of tortoise can live up to 150 years! Feeding: The basis of your Hermann tortoise’s diet should be green leafy plants: weeds, flowers, clover, wild lupine, grass, hibiscus, dandelion, charlock, watercress, chickweed, groundsel, plantain leaves and the leaves of plants and bushes like buddleja, ice plant, lilac, rose and bramble. These should be dusted in multi vitamins before feeding to avoid vitamin deficiencies. Health: This species don’t require vaccinations but will need regular check-ups at a specialist exotic vet. It is advisable to locate a vet before you bring your new friend into your home! If you are considering bringing an exotic pet into your home make sure you do thorough research before going ahead and be confident you can provide the right care and home for them. Always seek out an exotic vet beforehand as small animal practices don’t usually deal with exotic pets.